Due to your generosity over the last few years, we are giving Clean Drinking Water to over 40,000 school children in the CKDu affected areas to save our next generation, providing home based palliative care with Shanthi Nurses visiting CKDu & Cancer patients at home, providing Kenda made of native organic rice to school children to encourage organic farming & nutrition and have donated over $ 300,000 worth of electric hospital beds & other equipment to needy hospitals to help CKDu & Cancer patients and are now sponsoring over 40 Patients & Families with CKDu and Cancer. As you know all your generous donations are fully tax deductible. 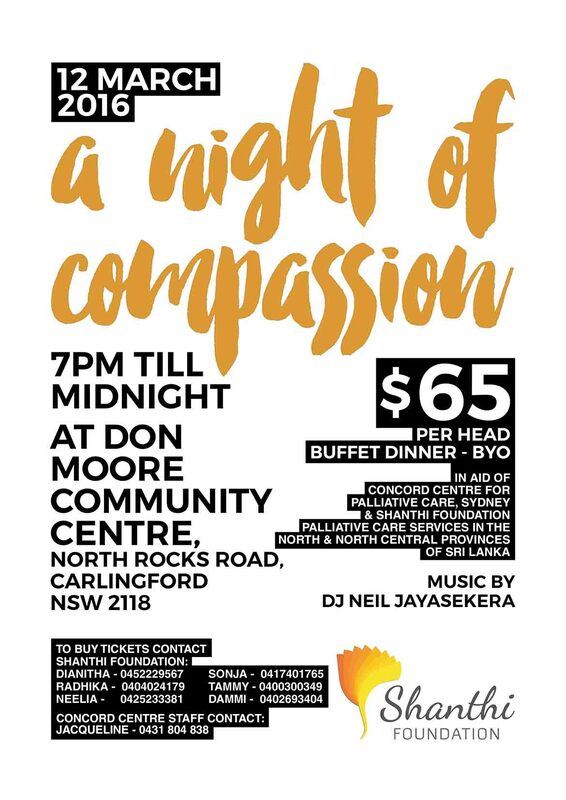 To continue our efforts in the North and North Central Provinces of Sri Lanka and to help the Centre for Palliative Care at Concord hospital in Sydney we have organised a dinner dance called -A Night of Compassion- with DJ Neil Jayasekera. The Sri Lankan High Commissioner His Excellency Mr S. Skandakumar , the Deputy High Commissioner Ms. Himalee Arunathileke and the Sydney Consul General Mr Lal Wickramatunga will also be attending. Please book your tickets early to avoid disappointment as we can only cater for 250 people at this venue.